Still no computer for me today but I thought I’d share that my Après Run Pullover arrived in a new biodegradable FedEx bag. That’s nice, no? Is there going to be an upload tomorrow? 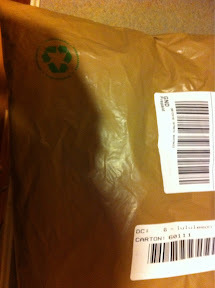 I have received several (too many) packages with the new FedEx biodegradable packaging and the. Website says a lulu bag is included but it never comes with it! Kind of frustrating since those bags are fantastic. Hurry up and get that computer fixed, Lulumum! I'm missing your posts big time!